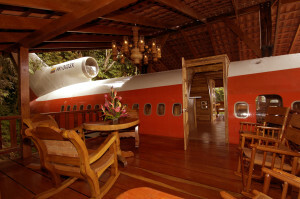 World Famous 727 Fuselage Luxury Suite – enjoy your jungle dreams in first class accommodations. Wow factors include teak paneled kitchen and dining area, two private balconies over each wing and gorgeous jungle canopy sunsets are complimentary. Prices range starting at $400 and up per night. 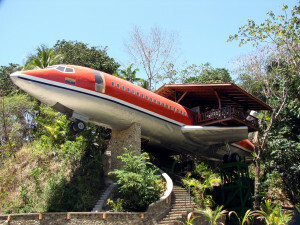 The vintage 1965 Boeing 727 “home” turned extravagant fuselage home away from home can be found in the jungle and beach setting nestled just next to the national park and jungle of Manuel Antonio. This area of Costa Rica provides some of the world’s brightest blue waters and sparkling white sand. This amazingly unique jungle oasis is a perfect unique, luxury vacation destination for adventure travelers, sport fishing, ecotourism, surfing, or simply go and enjoy a peaceful beach with beautiful white sand. But, if you are looking for the perfect destination wedding spot for the pilot in your life – you couldn’t do better than a wedding night in this amazing find. The Boeing 727 is perched on a 50 foot pedestal making it a breeze to enjoy scenic ocean and jungle views. The location is high above the ocean with a spiral staircase climb to enter. 1965 Vintage Boeing 727 refurbished and put to use as a private suite in Costa Verde. For those more modern travelers don’t be concerned about being without the convenience of which you become accustomed in a regular hotel suite. This treasure also comes with two air conditioned bedrooms, flat screen TV, kitchenette, dining area foyer, and both ocean and jungle views from the terraces. Enjoy this deck on the wing with amazing views. 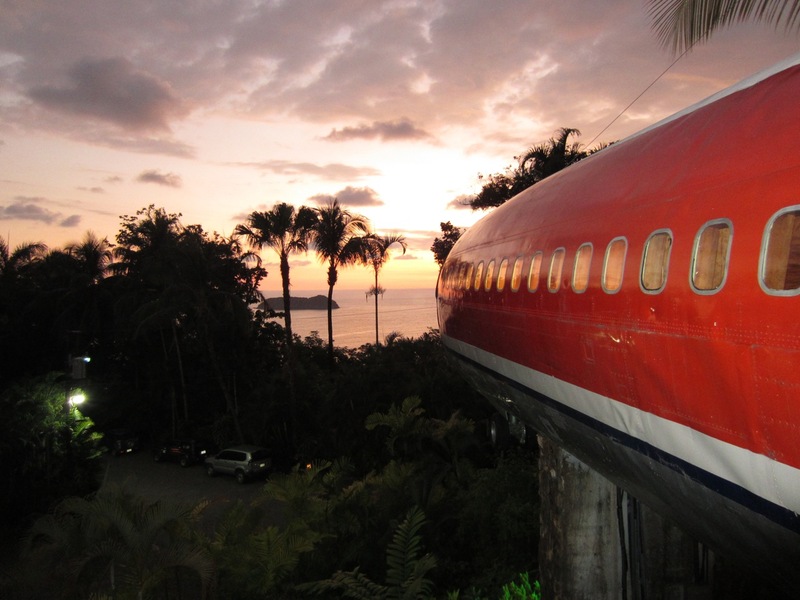 The aviation theme doesn’t stop with this vintage Boeing 727, one can also experience the unusual setting for your drink in the bar, or dinner in the restaurant, El Avión. El Avión, keeping in the aircraft enthusiast theme, is found inside an rebuilt aircraft (C-123 Fairchild). The restaurant offers another unique use of retired aircraft jets. This restaurant presents standard dining fare of salads, pasta dishes, seafood and beef. Choose a fancy tropical drink, wine that compliments your dinner selection or stay with the aviation theme. That’s right, you could choose to order the 727 Boeing Jet and sip a delicious mixed drink of vodka, coconut liqueur, cranberry juice and orange juice. As long as the luxurious theme based vacation is on the horizon, why not charter your own flight? Wondering why to use private jet charter? There are many benefits over commercial flights. Some of the obvious benefits include flexibility, privacy and convenience. More family time and less time waiting insecurity lines is a benefit everyone will appreciate. While using private jet charter, the passengers determine what time to leave and come back home. Leave at a time that is convenient for you, instead of having to adhere to the commercial airline schedules. Conveniently land and take off from airports that are most near your home and destination. Private jet charter companies take care of the details for you. No lost baggage and no crowded middle seat to have to deal with. The benefits are many. Jungle and Ocean Views from this Luxury Destination Suite in Costa Verde.